Incompetent director William C. Thomas’s They Made Me a Killer is based on a screenplay by competent writer Daniel Mainwaring, who was working under the name “Geoffrey Homes.” Mainwaring was a prolific screenwriter whose most famous contribution to film noir is his script for Out of the Past (1947), which was based on his novel Build My Gallows High (both were written under his Homes pseudonym). The script for They Made Me a Killer isn’t the problem. In the hands of a talented director and a better cast of actors, it could have been a crisp little thriller. There’s a decent amount of complexity in its familiar tale of an innocent man on the run, and the dialogue is snappy. Unfortunately it’s all handled so poorly that the protagonist’s flexible ethics end up seeming more like sloppy storytelling than anything else, and all the clever lines are delivered in too ham-handed a fashion to make much of an impact. 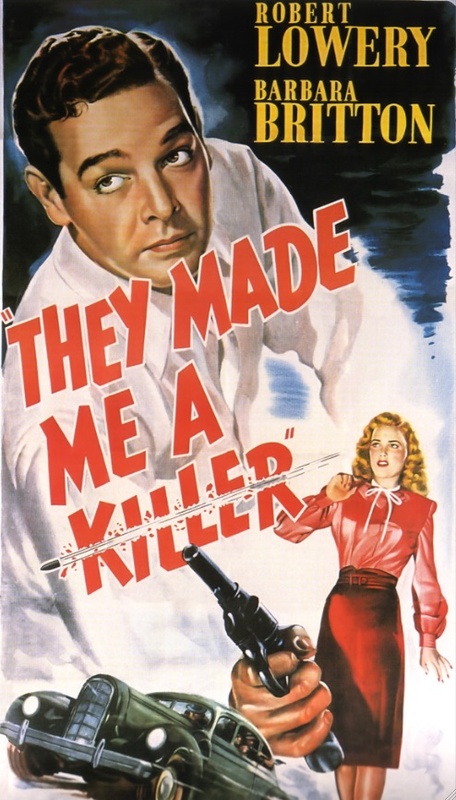 Produced by William H. Pine, They Made Me a Killer was released by Pine-Thomas Productions, the B unit of Paramount Pictures. It’s normal for low-budget productions to cut corners, but this picture has some of the most egregious examples of cost-cutting I’ve ever seen. Thomas employs rear projection frequently, and not just for scenes shot in cars, which is when the technique was most commonly used. There are numerous shots in They Made Me a Killer of people standing on a street corner in which everything behind them is clearly rear projected. In one scene, two actors stand in front of a rear-projected house, then one of them turns to walk toward it. The scene immediately cuts to a shot of her ringing the doorbell, standing in front of a door that doesn’t look as though it matches the house we saw in the establishing shot. There are certainly less noticeable and more artful ways to keep a picture under budget. When They Made Me a Killer begins, Tom Durling (Robert Lowery) is leaving Chicago. His brother was killed there, and he has no desire to stay. He’s leaving his job as an auto mechanic, and heading for San Francisco. Once in California, he stops at an intersection. San Francisco is 248 miles away, and Santa Marta, “The Pearl of the Valley,” is just five miles away. He heads for Santa Marta, hoping to sell his souped-up jalopy, which he has modified to achieve speeds of up to 120 miles per hour. He’s approached by a potential buyer named Betty Ford (Lola Lane), who tells Durling that she wants her boyfriend to buy the car for her for her birthday. 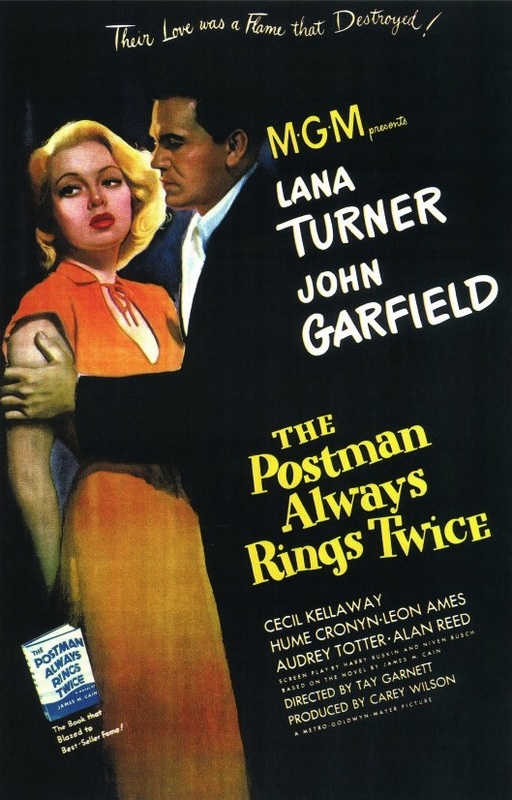 Agreeing to meet her boyfriend the next day to close the deal, he ends up parked outside the Santa Marta Trust and Savings Bank the next morning with Betty exhorting him not to move, even to drive around the block to avoid a parking ticket, while Jack Conley (Edmund MacDonald) and Frank Conley (James Bush) are inside, making a very large withdrawal. When he had initially shown her what his blocky hot rod could do, Durling had told Betty, “All I wanna do in this town is leave it.” He’ll get his wish, but he’ll get it the hard way. He’s not the only one. 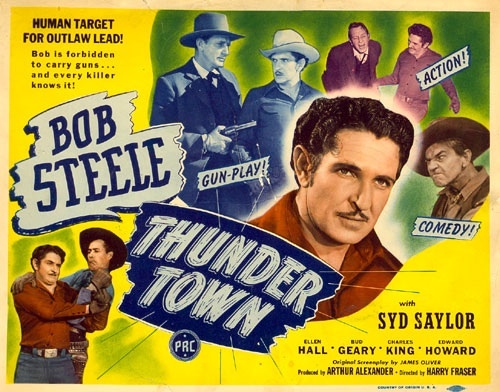 Caught in the crossfire is a hapless little punk named Steve Reynolds (Byron Barr), a bank clerk at the Santa Marta Trust and Savings Bank who’s hanging around the getaway car because he has the hots for Betty. Betty and the Conley brothers make off with $100,000, but Durling drives them into a ditch. 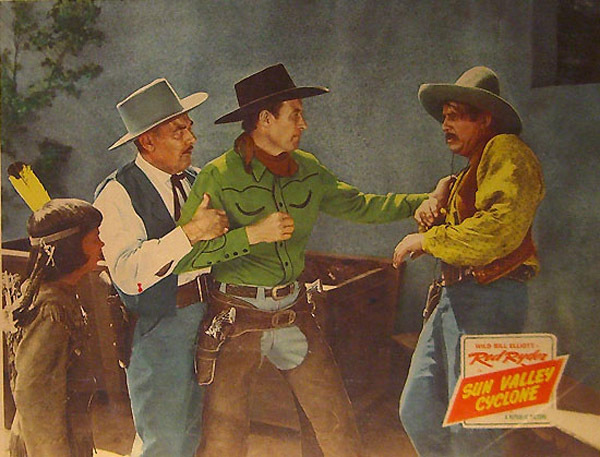 He’s knocked unconscious, the robbers flee, and he’s left to take the rap. He hangs his hopes for freedom on young Steve Reynolds, who lies in the hospital dying from a bullet wound. Steve’s sister June (Barbara Britton) comes to visit him in the hospital. She and Durling are immediately attracted to each other, and she reluctantly becomes his ally as they race to prove his innocence, and Steve’s. All of this probably sounds better on paper than it plays out on screen. The acting is bargain basement and the direction is maladroit, turning what could have been an entertaining one-hour programmer into a forgettable snoozer. Posted in 1946, May 1946 and tagged Alexander Laszlo, Barbara Britton, Byron Barr, Daniel Mainwaring, Dorothy Vaughan, Edmund MacDonald, Edward Earle, Elisabeth Risdon, Film Noir, Frank Albertson, Fred Jackman Jr., Harry Hayden, Henry Adams, James Bush, John Harmon, Kae Salkow, Lola Lane, Metropolis Productions, Owen Francis, Paramount Pictures, Paul Harvey, Pine-Thomas Productions, Ralph Sanford, Robert Lowery, They Made Me a Killer, Victor Potel, Will Wright, William C. Thomas, William H. Pine, Winston Miller. Bookmark the permalink. Frank Wisbar’s Devil Bat’s Daughter is a film that follows the template created by Dracula’s Daughter (1936), but doesn’t quite get it right. 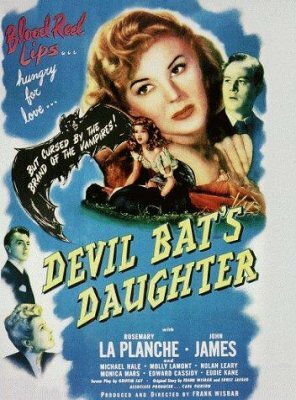 Like Dracula’s Daughter, Devil Bat’s Daughter is a sequel to a Bela Lugosi horror film — in this case, The Devil Bat (1940) — that does not feature Lugosi. Instead, the protagonist is … you guessed it, his character’s daughter. But while Dracula’s Daughter was a slick, good-looking Universal horror picture that featured a haunting lead performance by Gloria Holden, Devil Bat’s Daughter is a run-of-the-mill Poverty Row mystery thriller whose connection to its predecessor feels forced. I haven’t seen The Devil Bat, but based on plot synopses, there seem to be several inconsistencies with how its treated in its sequel. 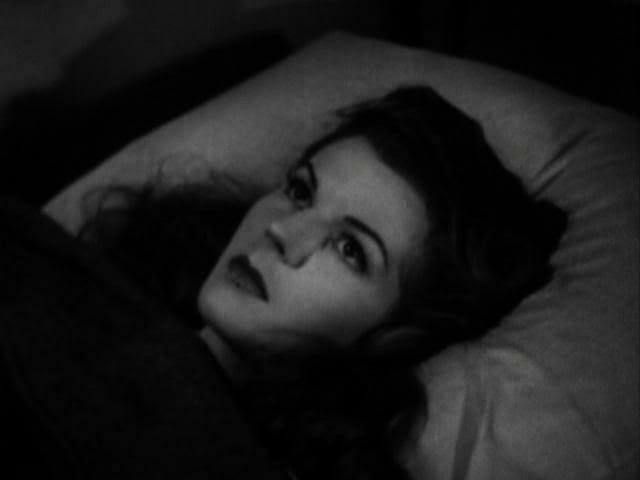 Nina MacCarron (Rosemary La Planche), is the daughter of Dr. Paul Carruthers (Lugosi), of The Devil Bat, but she uses her mother’s maiden name. 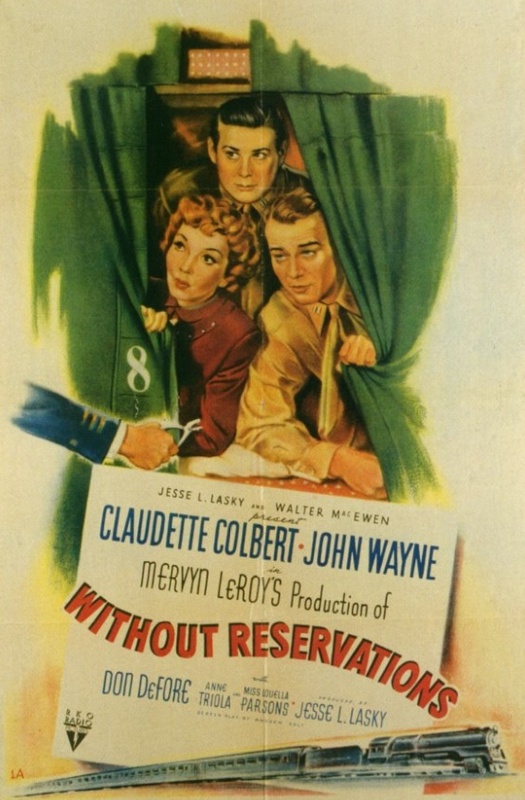 Returning in a stupor to her father’s home in Wardsley, New York (Heathville, Illinois, in the original), she collapses while searching the basement where he conducted his experiments (the basement was also apparently not present in the first film). She is taken in by the physician Dr. Elliot (Nolan Leary), who cares for her while she lies in a catatonic state. After she escapes from the hospital, Dr. Elliot has her transferred to the care of a psychiatrist, Dr. Clifton Morris (Michael Hale), who treats her while she lives in his home with him and his wife, Ellen Masters Morris (Molly Lamont). With Dr. Morris’s treatments, she slowly returns to normal, but she is plagued by terrifying visions (rippled footage from The Devil Bat). Intrigue abounds. We learn early on that Dr. Morris has a mistress, Myra Arnold (Monica Mars), who is pressuring him to divorce his wife, whom he only married for her money. When Ted Masters (John James), Mrs. Morris’s son from her first marriage, returns home, he and Nina start to fall for each other, but a series of murders throws Nina’s sanity into question. The film seems confused about what type of picture it wants to be. There’s plenty of talk of vampires (Lugosi was inextricable from his most famous role), but it doesn’t come to anything, and this isn’t really a horror picture. Devil Bat’s Daughter is modestly entertaining, but I was hoping for more. Director Wisbar was a German émigré, and his previous film, Strangler of the Swamp, was a great-looking, creepy little horror picture. Like Devil Bat’s Daughter, it also starred Rosemary La Planche, Miss America 1941. It’s too bad for genre film fans that La Planche wasn’t in more movies, especially horror movies. She could have been one of the great scream queens. She’s uniquely pretty, with thick eyebrows, big eyes, bow lips, a very straight nose, and mountains of wavy hair. Her face retains its attractiveness even when she’s screaming, and she sure can take a fall while running. 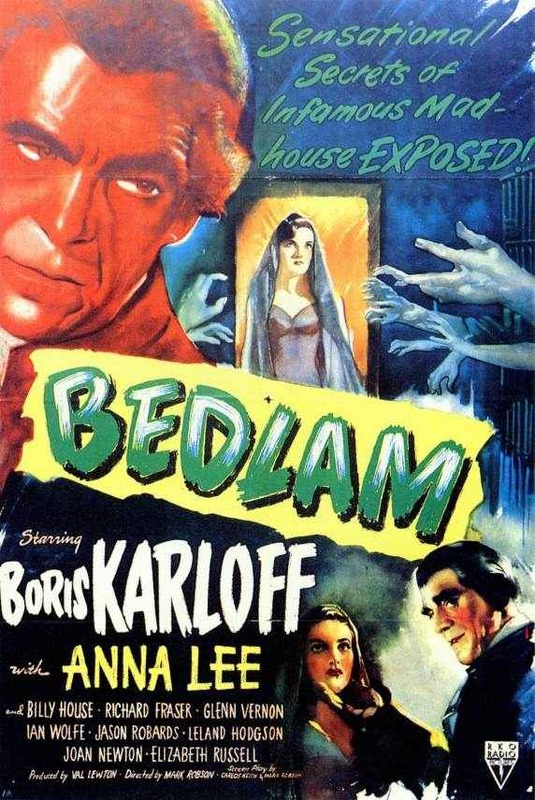 Posted in 1946, April 1946 and tagged Alexander Steinert, Bela Lugosi, Carl Pierson, Devil Bat's Daughter, Douglas W. Bagier, Ed Cassidy, Eddie Kane, Ernst Jäger, Frank Wisbar, Griffin Jay, Horror, James S. Brown Jr., John James, Leo J. McCarthy, Michael Hale, Molly Lamont, Monica Mars, Mystery, Nolan Leary, P.R.C., Rosemary La Planche, The Devil Bat. Bookmark the permalink.